I almost felt bad testing out these bags in San Francisco. Detours bags are made to handle the constant drizzle, mud and muck of a Pacific Northwest commute—which makes sense, since the company hails from delightfully drizzly Seattle, WA—the misty fog of the Bay just doesn’t seem like enough of a challenge for the tough, all-weather gear. I said “almost,” because the truth is, these bags are awesome regardless of the weather. Fair warning, there are going to be a lot of photos in this post. The Detours gear is just too stylie to not show off. I had a chance to try a small selection of bags of various styles, sizes and uses. I’ll start from smallest bag and work my way up to the magical three-in-one pannier bag. I have been on the hunt for a contraption to hold my phone so I don’t have to dig into my backpack to consult the route before getting hopelessly lost. The Roadie definitely does the trick. A simple ratcheted attachment allows you to securely affix the bag to the stem of your bike (my bike, Stallion, who finally gets to be featured in a post, does not have room for Roadie on the stem, but plenty of other spots work great as well). The clear, water-repellant phone pocket is touchscreen friendly making it easy to access information or refer to your phone as needed. The phone pocket is really more of a flap with a magnetized closure to the main utility pocket. The zip pocket has plenty of room for minor necessities. I fit my patch kit, allen wrench, levers, keys, and ID in there, no problem. The Roadie also comes in gray with a bright green interior (pictured here) and in red with a grey interior. The Roadie retails for $32. Yes, you can definitely put your coffee grounds in here and keep them safe and dry. But that’s not the only use for the super versatile Coffee dry bag. 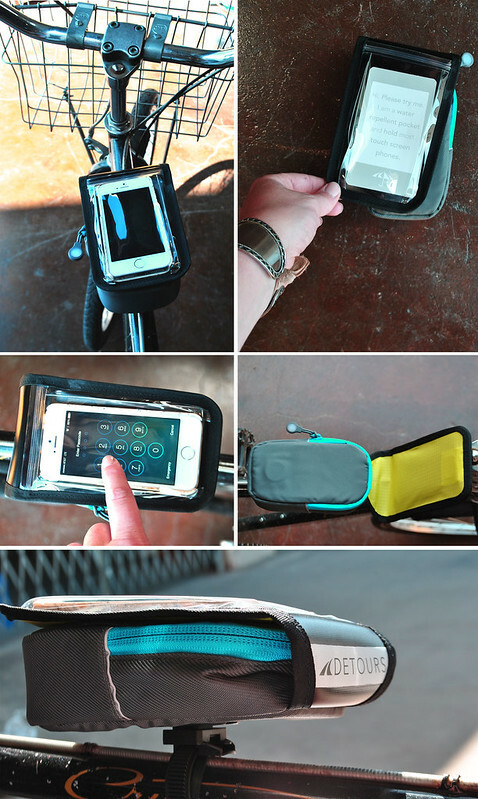 Throw in your mid-ride snacks, any electronics you want to keep safe (besides your phone since it’ll be in the Roadie), or maybe protect your other belongings from damp, sweaty bike spandex? The adjustable straps make it easy to secure the Coffee dry bag wherever needed. However, while the top strap is a quick release buckle, the bottom strap must be undone completely, which can be a bit of a hassle. • The Evergreen Blend: ride through the forests and around Mount Rainier in our home state of Washington. • The Mile High Blend: ride through the alpine wonderland of Colorado. 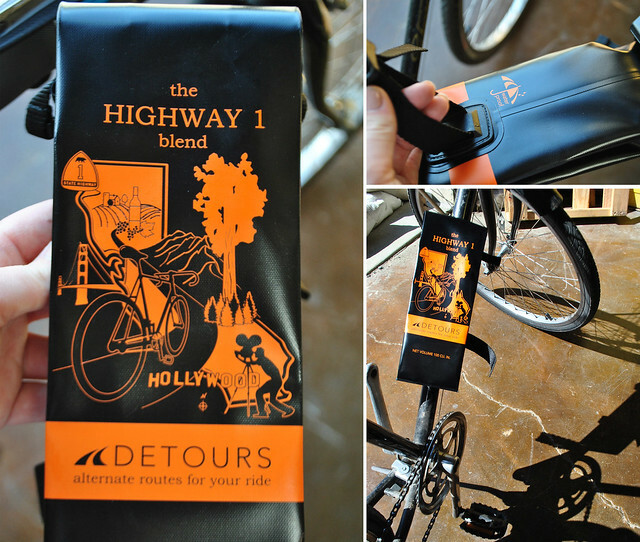 • The Highway 1 Blend: ride down the Pacific Coast Highway in California (pictured here). • The 10,000 Lakes Blend: ride through the 10,000 lakes and Twin Cities in Minnesota. • The Lighthouse Blend: ride along the rocky coast in Maine. The Coffee Bag retails for $20. Or $80 for the set of five. The Rainier Duffel has two adjustable straps to secure the bag to your handlebars and, when you reach your destination, it can transition seamlessly into a cross-body bag thanks to a built in shoulder strap. 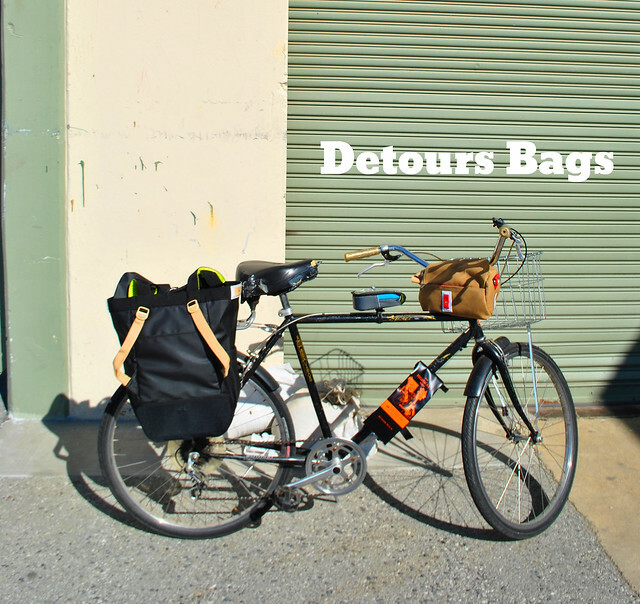 Plus, the clever folks at Detours designed the duffel with a little side pocket just to hold the shoulder strap so it doesn’t flop around when attached to the handlebars. Attention to detail—I love that. Speaking of detail, the flap of the duffel, which like the Roadie has a magnetic closure, features a sparkly banana design (you can see a better photo here). I think this is a great touch. The zipped interior compartment also contains a smaller zip pouch and two slip-in pockets. The Rainier Handlebar Duffel also comes in black and “Golden Gardens,” a cheery floral pattern. Retail price is $50. Ok, I might have saved the best for last. 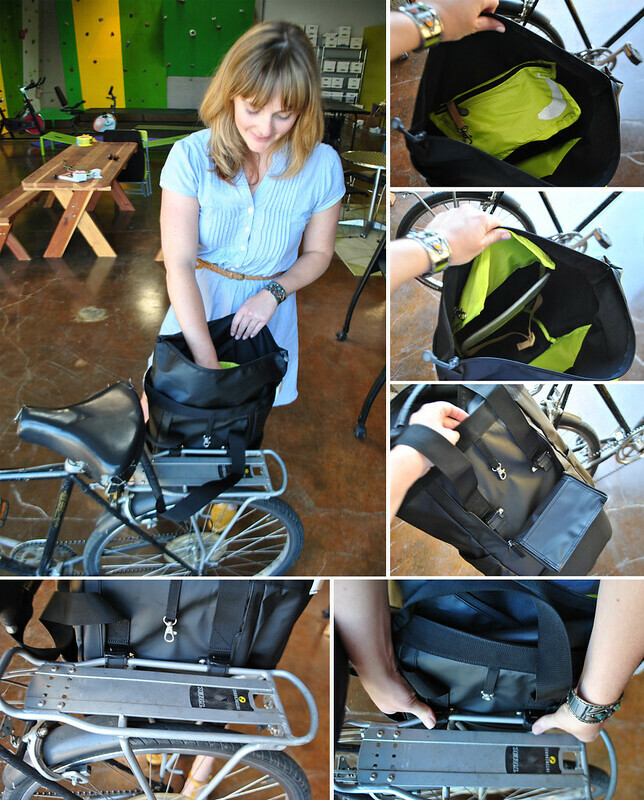 The Ballard Market Pannier is the most versatile bag of the bunch with three different carrying options (Elizabeth reviewed and loved this pannier back in 2012). 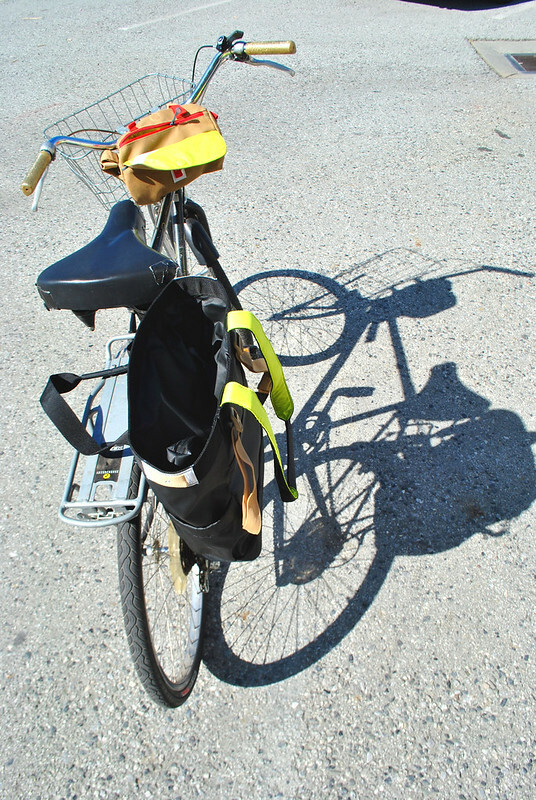 First and foremost, it is a pannier bag, which attaches with two simple, yet secure rack clips. The bottom is a heavy-duty waterproof material to reduce wear-and-tear and keep belongings safe. The interior space has a small zip pocket, key hook, and a laptop compartment, making it an ideal commuter bag. 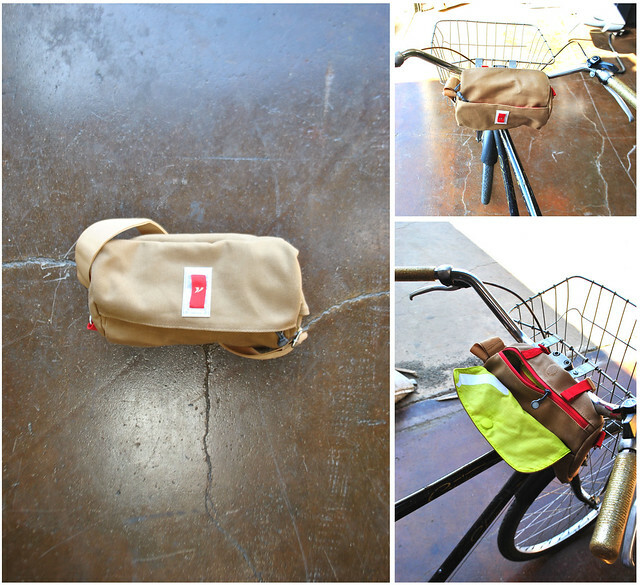 As promised, the Ballard Market Pannier is not just a pannier! The bag also has padded straps to carry as a shoulder tote. And the tote straps convert into backpack straps for heavy loads! So clever. 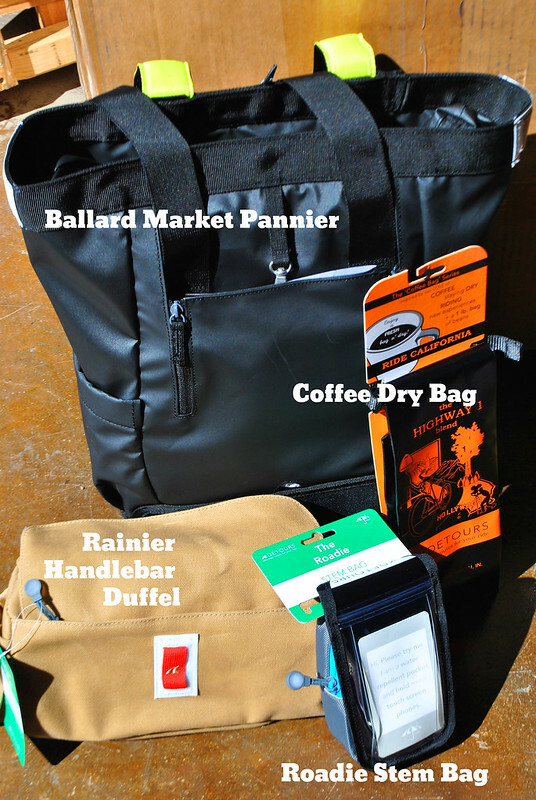 Overall, the Ballard Market Pannier is a large enough (11”W x 15”H x 5.5”D) to easily accommodate commuter gear—for me, that includes my 15″ laptop, running shoes & clothes, notebook, wallet, and a few other essentials. Plus, this nifty 3-in-1 setup comes in black (pictured here) and two colorful patterns. The Ballard Market Pannier retails for $80. The bags I review here are only a small portion of the overall variety that Detours offers—from ultra-tough touring rack trunks to playful, more petite seat post bags. I’m confident that riders will find a bag to suit his or her need whether for trips to the farmer’s market, daily commute or more rigorous rides.